No sooner had the world recovered after disturbances of 2011 resulted in NATO's "victorious" war in Libya than it is offered a new military amusement – a peace-enforcement action against Iran. Sure, it is quite awaited, and Washington's political rhetoric in recent years many times came to open menaces to Tehran. However, things have never come to cold aggressions so far. 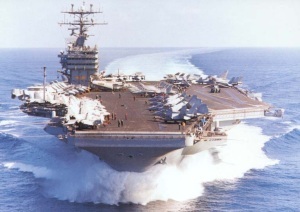 Now the situation is different – the US is concentrating an impressive strike naval force in the region, and it is nonsense to think that the target is not Iran. Crisis around the Islamic Republic of Iran strained in November 2011 when International Atomic Energy Agency (IAEA) published report firstly mentioning about military component in Iran's nuclear program. On December 28, 2011, Vice President Muhammad-Reza Rahimi menacingly reacted on Washington's potential sanctions against Iran saying his country would reply to any pressure with blockade of oil traffic through the Strait of Hormuz. Iranian Navy Commander Admiral Sayari assured that closing of the strait would be "easier than drinking a glass of water". Later on, Iran announced opening of the uranium enrichment plant in Qom. 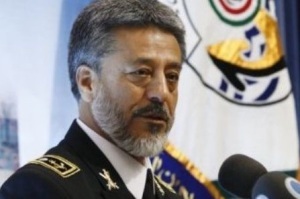 "The Islamic Republic of Iran does not ask for the permission of any country for implementing its defensive strategies", said Revolutionary Guards commander General Hossein Salami. "…We have no doubt about implementing our defensive strategies for defending our vital values and we will act more resolutely than ever", he added. 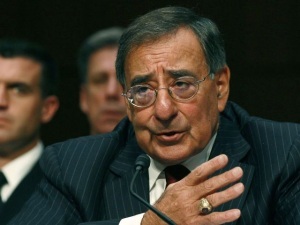 US Secretary of Defense Leon Panetta said on CBS on January 8, 2012 that "the United States will not tolerate the blocking of the Strait of Hormuz. That's another red line for us and that we will respond to them". He was echoed by the chairman of Joint Chiefs of Staff Gen. Martin Dempsey: "They've invested in capabilities that could, in fact, for a period of time block the Strait of Hormuz. We've invested in capabilities to ensure that if that happens, we can defeat that". As of today, three US Navy's carrier strike groups and considerable amphibious landing forces are deployed in the Arabian Sea and adjacent waters. "If you ask me what keeps me awake at night, it's the Strait of Hormuz and the business going on in the Arabian Gulf", said US Chief of Naval Operations appearing in Washington. "The Navy won't be taking their eye off the ball", he concluded. In its turn, Iran demonstratively held a naval exercise Velayat-90 right on the New Year's Eve. Tests of new antiship missiles showed determination to block oil shipping in the Strait of Hormuz if global community invokes economic sanctions against Iran. However, the embargo has not been imposed so far, and the sides mix their aggressive rhetoric with assurances to handle the crisis peacefully. For one, Pentagon's press secretary George Little said the strait is "an economic lifeline for countries in the Gulf, to include Iran" and "it is important to lower the temperature". Iran: Naked Words or Real Threat? In 2008, Washington Institute for Near East Policy acknowledged seriousness of the threat posed by Iran's mobile coast-based missile batteries, antiship missile systems, and small-size missile boats and ships. In asymmetric naval warfare against US Fifth Fleet, Iran can also use unmanned aerial vehicles, air-cushion vessels, mines, combat divers, and midget submarines. Some people still underestimate significance of Iran's threats thinking they are nothing more than words. US State Department spokesman Mark Toner called Iranian threats "bluster". He specified that statements of Rahimi are "another attempt… to distract attention from the real issue, which is their continued non-compliance with their international nuclear obligations". But not everybody adheres to that opinion. War game exercises indicate that the potential war against Iran in the Persian Gulf may turn into a real disaster for US military. That was proved by naval exercise Millennium Challenge 2002 held since July 24 till August 15, 2002 and cost American budget $250 mln. It took almost two years to prepare that exercise, one of the largest and most expensive military maneuvers in America's history. The scenario implied that Blue country (the United States) delivered an ultimatum to a Red pariah state in the Persian Gulf (read, Iran) and gave one day to surrender. Red, commanded by retired Marine Corp Lt. Gen. Paul Van Riper decided to use old time-proved troop control methods without sophisticated hardware. For instance, they used motorcycles to transmit messages and light signals to control aviation. According to scenario, Red massively used missile weapons and destroyed 16 Blue's warships – an aircraft carrier, ten cruisers and five amphibious landing ships. Then came small-size missile boats and suicide vessels whose gnat-stings destroyed greater part of US Fifth Fleet in a day. The war game resulted in a conclusion that the US would be defeated in conventional war against Iran. Geographic factors play into Iran's hands as well. Having no opportunity to act in blue waters of Indian Ocean, the US would have much less time for response, and – what is more important – they could not conduct engagement at a safe distance. All US Navy's arsenal meant for high sea warfare could not be used in the Persian Gulf. On the other side, the US torrentially loses time for settling Iranian problem in a heavy-handed way. According to the IAEA report, Iranian nuclear program looks not so peaceful, since military researches were held as well. Thus and so, Iran's nuclear weapon is just a matter of time, and probably, not a long-run prospect. If Iran acquires even a bunch of nuclear warheads, settling the problem through the use of force would be impossible. The question is whether the US would venture upon kicking off the worst scenario for the Persian Gulf. It seems they would. It would probably take a year for Tehran to assemble a nuclear bomb, said US Secretary of Defense Leon Panetta in December 2011. As for him, the US won't let than happen and use force, if needed. First of all, it is a new instability zone primarily controlled by warships, deck aviation, and sea-based cruise missiles. By the way, reserves of the latter ones are limited and have been seriously reduced after recent attacks on Libya. This could be a deterrent and postpone the D-day. In potential military operation against Iran, NATO allies exhausted by warfare in North Africa and impinging wave of economic crisis would unlikely help their patron. Recent deployment of newest destroyer HMS Daring to the Persian Gulf is rather an allied act supporting the senior partner than a substantial military assistance. Today, the destroyer has no strike capabilities but may render serious help in air defense thanks to Sea Viper advanced missile system. Economically, the crisis in the Strait of Hormuz may result in oil cutoffs and sharp rise in energy prices which would aggravate economic problems of developed countries. European oil refineries either discontinue or reduce purchase of Iranian oil trying to reorient on new suppliers. "Refiners are cutting back on purchases of Iranian oil in response to new US sanctions and the anticipation of an EU embargo", David Greely, head of oil analysis at Goldman Sachs, wrote in his report. EU foreign ministers will convene on January 23 and may decide to embargo Iran. Most likely, Japan would back the EU: "Nuclear development is something that the world can’t shut its eyes to, and we understand the United States’ position… In the past five years, we have reduced... the amount of oil imported from Iran… We wish to take planned and concrete steps to further reduce this share, which now stands at 10%", said Japan's Minister of Finance Jun Azumi addressing a press conference jointly with his American counterpart Timothy Geithner. By the way, the latter visiting Asia tried to persuade China and other countries into supporting the West's efforts and reduce imports of Iranian oil. He succeeded not everywhere, however. For one, China took a two-faced stand. A spokesman for Chinese foreign ministry said that Beijing "is opposed to a national law prevails over international regulations and imposes unilateral sanctions on other countries". Turkey was more specific: "We are not bound by any decision except for the UN decisions", said Turkish energy minister Taner Yildiz commenting Washington's calls to waive import of Iranian oil. Meanwhile, Russia cannot substitute Iran as oil supplier. "Our country is producing oil at its maximum output, and we can't increase production volume sharply. There are few countries capable to do that, what comes to my mind is only Saudi Arabia and Kuwait", said Vagit Alekperov, the president of Lukoil. So far, Russia has not changed its attitude towards Iran's problem and still charges the West of the tension escalation. "Extra sanctions against Iran as well as potential strikes at the Islamic Republic of Iran will be undoubtedly seen in the international community as an instrument for regime change in Iran", said Gennady Gatilov, Russia's deputy foreign minister. "Our stance is that considering earlier adopted UN Security Council's resolutions imposing restrictions on military cooperation with Iran, sanctions against Iran through UN have completely worked themselves out", he said. "An obvious trend to aggravation of the Iran's issue is recently seen. Unilateral steps taken by Western countries going beyond UN resolutions have negative impact on Iran's people and economy. Such course undermines the world community's efforts aimed at settling of Iranian nuclear problem. Anything offered for UN's approbation beyond the framework of mentioned resolutions bears no relation to stiffening of nuclear non-proliferation regime", emphasized the top-ranking diplomat. Certainly, war of the Strait of Hormuz would instigate actions of radical Islamic organizations all across the world, and we may face another round of terror. Actions of terrorists would be primarily aimed at the US and its allies. However, the present-day world is so small that rings in the water raised by extremist groups against "the world gendarme" will reach Russia anyway. So, the question is do we really need it? The bad peace is always better than the good quarrel.